OXFORD, Miss. — The No. 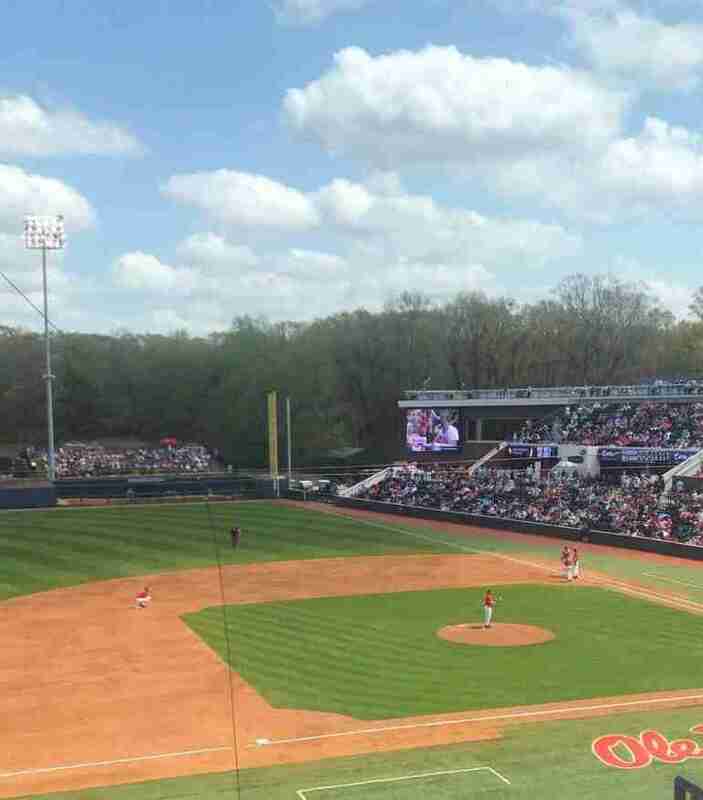 16 Florida Gators arrived in Oxford for a weekend series with the Rebels, bringing with them a 21-10, 4-5 (SEC) record. The No. 18 Rebels, who began the weekend sitting at 20-10 overall, 6-4 in the SEC, took the series from Arkansas last weekend before falling in midweek action to North Alabama. Florida has been very strong of late, making College World Series runs for the last four years and seven of the last nine, so the matchup at Swayze of these two top-25 teams was sure to be an action-packed series. To say it was a good night at the plate for the Rebels would be an understatement. Every starter had at least one hit, while seven of the nine Rebels notched multiple hits, including Tyler Keenan who tallied a team-high three hits. The contribution from catcher Cooper Johnson continues to be without question. In Friday night’s game, the junior hit a home run and notched five RBIs, highest among Ole Miss hitters that night. He also erased a Gator from the base path. Here are a few of Cooper’s highlights from the win. In addition to his hitting prowess, Johnson proved once again why he’s so dangerous behind the plate. Tyler Keenan also had a huge game Friday night, increasing his SEC-leading RBIs to 47 with a home run in the third inning. “We came out and wanted to set the tone,” Keenan said. “That (home run) was a big swing…that was big for us. (But) not just me, it was everyone,” Keenan said, paying tribute to his teammates. Designated hitter Cole Zabowski got in on the action, hitting a home run in the third inning that gave the Rebels the lead for good. All in all, the Rebels pounded 17 hits in the game, earning praise from their head coach. Starter Will Ethridge looked solid through three innings Friday; however, in the fourth inning he would roll his ankle covering first on a throw from first baseman Kevin Graham. Ethridge also aggravated a recurring blister on his throwing hand and would be forced to leave the game. Tyler Myers came on in relief and went the rest of the way, allowing just two runs on two hits and striking out four, saving the Rebel bullpen for the last two games of the series. The victory over the Gators gave Coach Bianco his 300th SEC win. With inclement weather expected in Oxford Saturday night and Sunday, Game 2 of the series was moved to 12 noon Saturday with Game 3 scheduled as the back-end of a doubleheader. Ole Miss jumped on the board quickly, scoring two unearned runs in the first inning. The Rebs never looked back. The biggest day at the plate came from shortstop Grae Kessinger. The Oxford native finished a perfect 5-for-5, producing five RBIs in the process.
.@Swagulater15 3-3 with 3 RBI's! From a runs-scored perspective, Anthony Servideo led the team with four—one can say it’s a good day when the nine-hole hitter scores four. Thomas Dillard also crossed the plate three times. In the fifth inning, the Rebels blew the game open, scoring six runs on eight hits—including six singles and two doubles. B5 | That's 5 RBI's for @Swagulater15 today! Double down the left field line scores two Rebels. Defensively, Cooper Johnson was outstanding, yet again, from behind the plate. His ability to remove runners attempting to steal and to slow down an opponent’s running game is invaluable. In an outstanding defensive play of his own, Ryan Olenek contributed a “web gem” that robbed the Gators of a base hit. WHAT. A. CATCH. @ROlenek takes away a base hit laying out in center! Saturday starter Doug Nikhazy won his third game, going six innings in the contest. He struck-out six and allowed just a single run while scattering seven hits over the six innings pitched. Taylor Broadway and Kaleb Hill went the rest of the way for the Rebs. Just another day at the office for @Dougnikhazy! In the second game of the day, the Rebels were forced to battle back from a nearly impossible 8-0 hole after spotting the Gators four runs in the third inning and another four runs in the fourth. It was a tough day for starter Houston Roth who gave up four unearned runs in the third. “With this offense, you hope you’ll maybe make it close,” Bianco said of his team’s comeback. “We challenged them after the first game and said you know it would be such a mediocre attitude to think we have two in the bag and if we lose this one its ok,” Bianco explained. But that was not to be the case. The Rebels’ offense got on the board in the fourth inning when Cole Zabowski blasted his second home run of the weekend, a two-run dinger that also scored Thomas Dillard. Rebels on the board thanks to a two-run shot by @Cole_Zabowski! At the end of four complete, Ole Miss trailed 8-2. But the Diamond Rebs weren’t going down without a fight. The Rebel fifth began with three straight singles from Anthony Servideo, Ryan Olenek, and Grae Kessinger. Then came a lightning delay of over an hour. When play resumed, three consecutive Ole Miss hitters walked. Catcher Knox Loposer then smacked a two-RBI double that scored Tyler Keenan and Thomas Dillard. Chase Cockrell’s RBI single allowed the Rebels to take the lead, and an Olenek single put the Rebs up 10-8.
.@chase_david11 gives the Rebels the lead! However, the Gators weren’t done yet as they scored twice in the sixth inning to tie the game at 10. But in the bottom of the sixth, the Rebels regained the lead when Zabowski and Graham pieced together singles, with Zabowski later scoring on a Florida balk. Ole Miss added an insurance run in the seventh inning when Olenek doubled home Servideo who led the inning off with a triple. All the way to the wall @ServideoAnthony with a three-bagger! “When we play like this, we’re really good,” Grae Kessinger said after the series victory. After Houston Roth left the game, Conner Green pitched for 2/3 of an inning and Austin Miller took the mound for 1 2/3 innings. Then, usual-closer Parker Caracci came in and closed the door on the Gator rally in the sixth inning. The junior threw a season-high 3 ⅔ innings, allowing only a single and holding the Gators completely off the scoreboard. Caracci earned the win for Ole Miss, evening his win-loss record to 1-1 for the year. “I love having the ball in my hands,” he said after the win. For the weekend, Ole Miss put up some gaudy numbers at the plate. Tuesday the Rebels head to Trustmark Park in Pearl to battle in-state rival Southern Miss at 6 p.m. Weekend action has Ole Miss on the road at Kentucky Friday at 6:30 p.m., Saturday at 7:00 p.m., and Sunday at 1:30 p.m.